Is there anything better than Potato Frittatas? How about if you add some Chorizo? This Potato and Chorizo Frittata is perfect for breakfast, lunch or dinner! 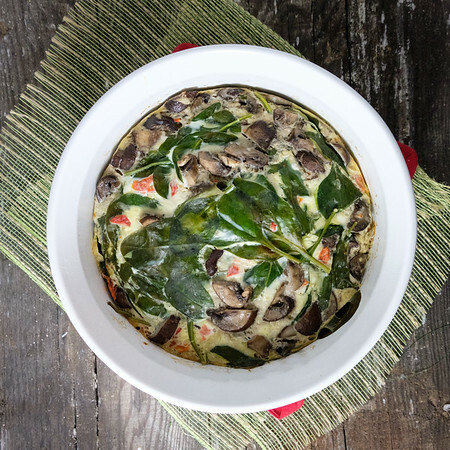 If you would ask me what is my favorite easy go-to dinner, I would have to say a frittata. Frittatas are so perfect to make up on the fly. You can reach into your fridge, pull out a little of this and a little of that, some cheese, and some eggs and you are good to go. There are different schools of thought when making a frittata. I’ve seen frittatas with as many as 12 eggs and some with as few as 4. Some do all of the cooking on the stove, some do all in the oven, and some do a bit of both. 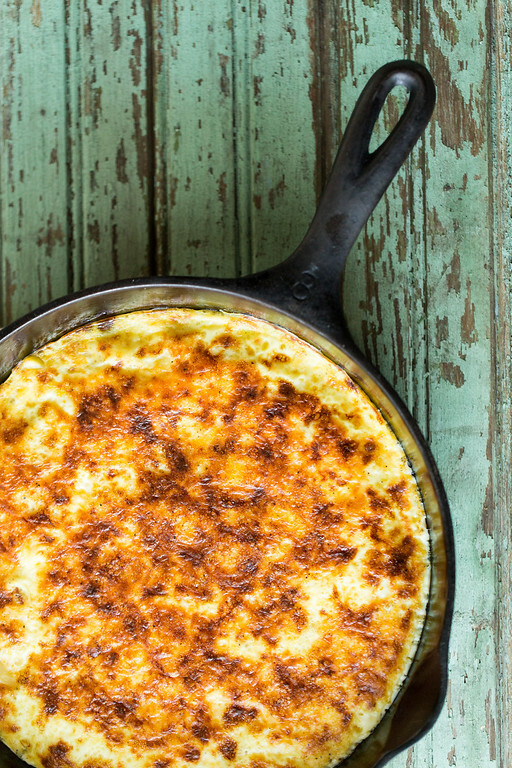 Click here to pin this Potato and Chorizo Frittata now! 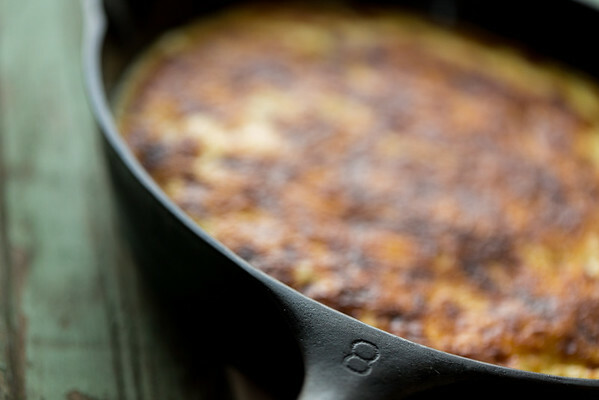 For me, there is only pan for a frittata and that is a cast iron one. Preferably one that belonged to your great grandmother or my case here, your mother-in-law. I believe I’ve mentioned before that my mother-in-law died before I met my husband so I never knew her. However, I love using her things. Just like she probably fed my husband when he was little with this wonderful old pan, now I am feeding him with it. If you don’t have a family heirloom, then start one now! Get you a cast iron pan, season it and have something to give your grandchildren! Sorry, I get a bit enthusiastic when talking about cast iron! Let’s get back to this frittata. 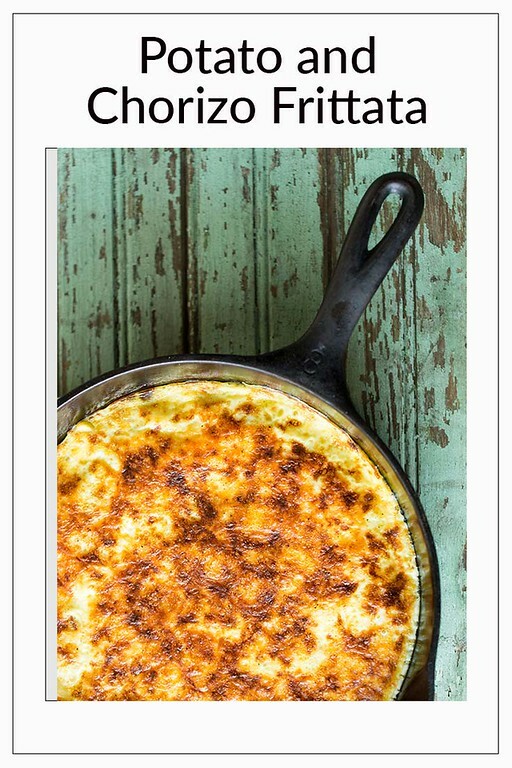 I have found my very favorite frittata formula and it only uses 4 eggs (well plus two egg whites)! It comes out unbelievable light and fluffy! I buy those containers of egg whites in the stores for my cocktails, so it was easy for me to have the egg whites available. Seriously, this will be my new formula for a frittata, the only thing that will very is the ingredients. I found this in Donna Hay’s Fresh and Light. She gives a basic frittata recipe and then gives several variations. I just used the basic frittata recipe and then made my own potato chorizo variation. The potatoes and chorizo in this frittata make it so hearty! It's perfect for breakfast, lunch or dinner! Place the eggs, egg whites, milk, salt and pepper into a bowl and whisk to combine. Heat about a tablespoon of olive oil in medium cast iron skillet over medium heat. Add the diced potatoes and chorizo. Cook, stirring occasionally until the chorizo has released some of it's gorgeous orange oil and the potatoes are just tender and golden. Sprinkle the cheese and the parsley over the top. Pour the egg mixture the filling ingredients in the frying pan. Let cook until the bottom and sides are set (about 10 minutes depending on how hot your pan is). Place pan in the oven on the middle shelf and broil until the top is puffy and golden, about 5 minutes. Remove from oven and let sit for about 5 minutes to rest. Hi. I’d like to try this recipe. I’ve never heard of dried chorizo, where do you get this, what is the difference? The dried chorizo is more like a hard salami or a dried, cured sausage, you find it in the deli section. this is a great recipe. top marks, Thanks for sharing. 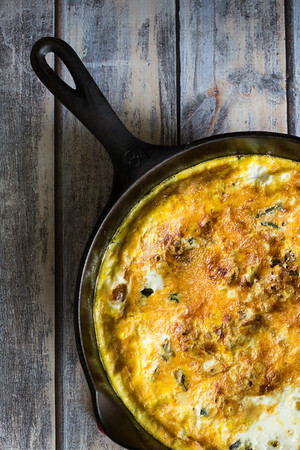 We do Frittata Friday at my house… I love eggs for dinner. This looks delicious and perfectly browned! Pam, I have dishes and kitchenware from my mom and my grandmothers and I love using them. I even have a mortar and pestle that I used to wax poetic about, thinking that my grandfather’s family had brought it over from Romania early int he 20th Century. But then my mom set me straight – they couldn’t possibly have carried it – way too heavy. Rather, they probably went to the lower east side in NYC and bought this one because it seemed like the one they had in the “old country.” I still love using it for crushing spices and all sorts of other things. I’m excited too! Love frittatas this combo is making me drool! This sounds really yummy! I love your kitty post too. We have three are they are rascally! Frittatas are totally my go-to for when I have no idea what else to make! Love these flavors together. It’s diabolical what you can throw into a frittata and it works every time. The cast iron does give the best results. We love chorizo! I need to try this the next time I serve it! I always use at least 1 extra egg white per egg when making scrambled eggs or whatnot. My dearly beloved doesn’t know the difference, and I’m saving him from his own cholesterol-loving self! Your frittata looks good. I have my grandmother’s cutting board – the apple shaped one. My mother sold everything else, and didn’t even tell me before she did so, or else I’d have bought some of her things. I love the notion of the added egg whites, Pam. I must remember that for next time. I usually have a stash of egg whites around here lately. Good idea! Hello, deliciousness! Love a good frittata and potato and chorizo are always a fabulous combo. 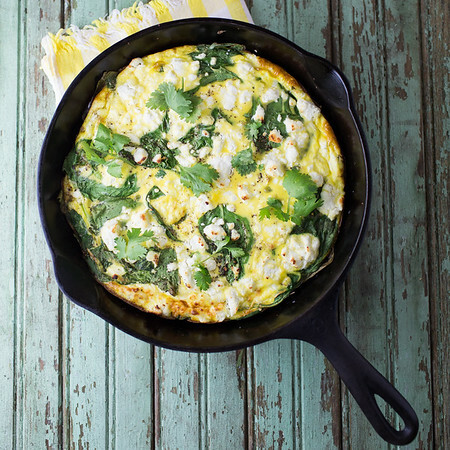 I’m a frittata fan, too, and this one looks amazing! Love how golden it is on top. Nice to add the potatoes & chorizo for great flavor & heartiness! I have a giant stainless mixing bowl I inherited from my grandma-in-law and think of her every time I use it. Come to think of it, I also asked for–and received–my mom’s nesting set of stainless mixing bowls when she was ready to downsize. I also think of mom’s thumb slipping through the ring to hold the bowl steady when I use one. Back to the recipe at hand–I’ve been making quiche lately since I discovered the family likes it, but I’m ready to go back to me ‘I can’t make a pie crust to save my soul’ frittata. This looks like a potential delivery device for kohlrabi . . .
aww I love the idea of passing down kitchen heirlooms… My daughter will absolutely getting all my skillets and such! The recipe looks amazing, as always darling!